Condition is Used. Always in a protective case. Case with kick stand. Phone currently has a screen protector on it. No damages on the phone, practically brand new. Originally a sprint phone. Comes with a charger and phone case as well. This Samsung Galaxy note 2 has had a case since purchase. I have switched carriers so I have no longer need for it. take note it does have a very faint scratch on the screen which can easily be repaired or ignored. Excellent shape , works perfect , runs on Sprint , and is unlocked . Has a crack in middle , but doesn't affect the phone at all . I just bought this phone 5 months ago and now i am selling it because i bought the note 3, it is in really great condition. Smartphone is fully functional with no known issues. Galaxy Note 3 for Sprint in Good Condition. There is very light burn in on the display, its so light cant take a picture of it. Glass has no visible scratches but it does have very light blemishes, also from being in a hard Otterbox case. 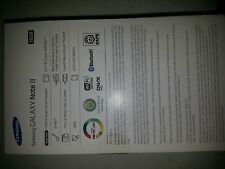 Selling a Samsung Galaxy Note 2 for Sprint customer, . This phone is in great condition and has been restored to factory settings. Up for sale is a Samsung Galaxy Note 2 (Sprint). No prepaid or MVNO carriers. The Samsung Galaxy Note 2 is in great condition 9/10 with only minor signs of use. Samsung Galaxy Note II SPH-L900 an overall great condition with only very small signs of use. include stylus and flip cover case. This device has been carefully tested to ensure full functionality. Selling a used Samsung Galaxy Note II (Sprint Network). Box, Mobile Device (Stylist included) owners manual, and Otter Box case included. Absolutely nothing negative lies within this device or accessories. At CIT Electronics, we are proud of the quality of our service and the products we provide. TESTING: We carefully test each Unit Used battery and back cover. "Good" condition. This could also have light screen burns, white spots, other small LCD marks. TESTING: We carefully test each Unit "Good" condition. This could also have light screen burns, white spots, other small LCD marks. At CIT Electronics, we are proud of the quality of our service and the products we provide. Device does not turn on. Being Sold AS IS. THIS PHONE HAS CRACKED GLASS AND A CRACKED LCD, AS SHOWN IN PHOTOS! THIS PHONE HAS NO BATTERY OR BACK PLATE, AS SHOWN IN PHOTOS! THIS PHONE IS UNTESTED! There may be a few minor scuffs and scratches on the side or back of the device. Up for sale is a Samsung Galaxy Note 2 SPH-L900 - 16GB - Gray (Sprint) Smartphone. - There is an image burn on the LCD screen. The image burn is easier to see when the screen is light in color. - LCD Screen (Image burn on the LCD screen). Esn: clean. 1 x Samsung note 2 for sprint. PHONE HAS A CRACKED GLASS SCREEN BUT STILL WORKS GOOD! YOU CAN REPAIR THE GLASS OR CONTINUE TO USE AS-IS! 1 x battery cover. 1 x battery. Up for sale is a Samsung Galaxy Note 2 SPH-L900 - 16GB - White (Sprint) Smartphone. - There is an image burn on the LCD screen. The image burn is a little easier to see on light screen. The image burn does not effect the functions of the phone but there is an image burn on the LCD screen. Up for sale is a Samsung Galaxy Note 2 SPH-L900 - 16GB - White (Sprint) Smartphone. - There is an image burn on the LCD screen. The image burn is easier to see when the screen is light in color. - LCD Screen (Image burn on the LCD screen). (Looks good, back panel attaches and stays put. 2nd battery included. (In the one picture where the phone is off you see "bubbles" that is because the original screen protector was put back on). In the pictures where it is lit up you might see reflections, sorry, couldn't prevent all of them)! Otterbox Defender Case. Excellent condition due to Otterbox Defender Case [included] with just minor wear on top-side while in case for life of cellphone . - Otterbox Defender Case. Samsung Note II 16gb - Marble White [Sprint - unlocked]. Samsung Galaxy Note 2 SPH-L900 Sprint Grey, Clean ESN Includes phone and battery only. No cables or sim card included. Cellular service locked to Sprint. Clean ESN. Samsung bar style smartphone in grey. 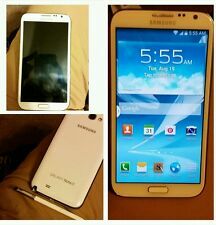 Up for sale is a Samsung Galaxy Note 2 SPH-L900 - 16GB - White (Sprint) Smartphone. - There is an image burn on the LCD screen. The image burn is easier to see on light screens. The image burn does not effect the functions of the phone. SAMSUNG GALAXY NOTE 2 SPH-L900 16GB WHITE (Sprint) A445. Has A Cracked Screen and the back lid does clip in. For Parts or repair only! Cracked LCD, Bad ESN, Parts Only. This phone works, but LCD is broken. You can hear sound, but can not see anything on the screen. It also connects to the computer. LCD is cracked and needs to be replaced. Stylus and battery (new) are included. BAD ESN NOT ABLE TO USE WITH SPRINT. Smartphone is fully functional with no known issues. Galaxy Note 3 for Sprint in Good Condition. There is very light burn in on the display, its so light cant take a picture of it. Glass has a few light scratches and very light blemishes, also from being in a hard Otterbox case. Up for sale is a Samsung Galaxy Note 2 SPH-L900 - 16GB - Gray (Sprint) Smartphone. - There is an image burn on the LCD screen. The image burn is easier to see when the screen is light in color. The phone is fully functional but has a image burn on the LCD Screen and we dont know if it will work on the Sprint Network. Up for sale is a Samsung Galaxy Note 2 SPH-L900 - 16GB - Titanium Gray (Sprint) Smartphone. - Touch Screen. What IS included What is NOT Included - LCD Screen. What Works/ What We Test For.